Why have a pre wedding shoot? So many couples ask me do we have to have the engagement shoot? We've been together years why would we need an engagement shoot? Of course you don't have to have a pre wedding shoot (fear not I'm not going to hunt you down drag you out of bed and force you to cuddle while I take photos) however if you're as of yet unsure or even just slightly considering one here's why I think they're such a great idea! Pre wedding shoots are such a great way to get to know you photographer. Its likely on the shoot you'll be spending up to an hour with them so its such a good opportunity to chat, having these roots really helps you feel comfortable on your wedding when they are posing you. As a massive fan of animals, travel and my family 90% of the time I am talking about ridiculous things my cats have been up to, my latest adventure or funny stories about my family. I absolutely love getting to know each and every one of my couples particularly the stories of how they first met and if you like I can even tell you how I met Ryan! This way on the big day I'm not a stranger turning up and popping a camera in your face, I'm someone you know and someone you can chat to if you need anything. This is also so important on your wedding day when following the ceremony and in between scoffing the canapes and talking to all of your guests we head off for portraits. I want you to be in the middle of your wedding enjoying every minute and having a pre wedding shoot means I know how you interact best and how to get the best from you both in your pictures without taking you away from your guests for too long. Pre wedding shoots are also a brilliant way to work out what you like. You've seen hundreds of photos online when you were planning your wedding and picking your photographer. This is the perfect time to try out ideas, get to know your photographers style and how they achieve their final images and if theres anything you don't like? Well now you know before the big day! And (if nothing else) in the run up to the big day when your head is spinning from caterers floral choices and what colour centre pieces are going to polish off your big day its an hour away just the two of you to get cuddled in really close and share some quiet moments together and a few laughs! Is it always just the two of us? Absolutely not! If you haven't guessed it by now I LOVE animals if you've got an excitable puppy, an old loyal hound, a mischievous kitty or even something more unusual bring them along! Not only is your pet part of your family and a huge part of your life they are now being included in your whole wedding process which may not be possible on your day, but people often feel more relaxed around their pets (as do I) they provide another face to focus on and often love to be centre frame! The same invitation extends to children however with both pets and children it is often best to invite a family member or friend to come along so they can take them for a little break while we get the photos of the two of you. Often pre wedding shoots are outdoors so its always advisable to dress weather appropriate which may include bringing along a hairbrush for wind or an umbrella for showers- especially in Lancashire or Manchester. Where should we have our pre wedding shoot? Again there really is no right or wrong answer to this. I like to let each couple suggest locations for the shoot, after all these are your photos and I want you to look at them and love where you are. I often suggest somewhere local to you or somewhere meaningful- perhaps the woods close to where your first home together was, the spot you got engaged, your favourite place to take an evening stroll. 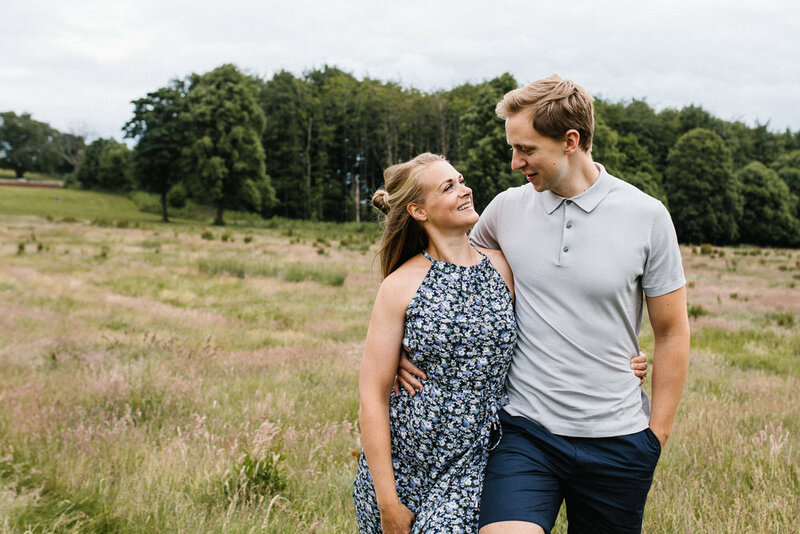 As a Lancashire wedding photographer I am lucky enough to be surrounded by beautiful countryside and super close to lots of amazing city centre urban environments and love shooting in both types of locations. The location you pick can really represent you as a couple! When should we have our pre wedding shoot? This varies from couple to couple. 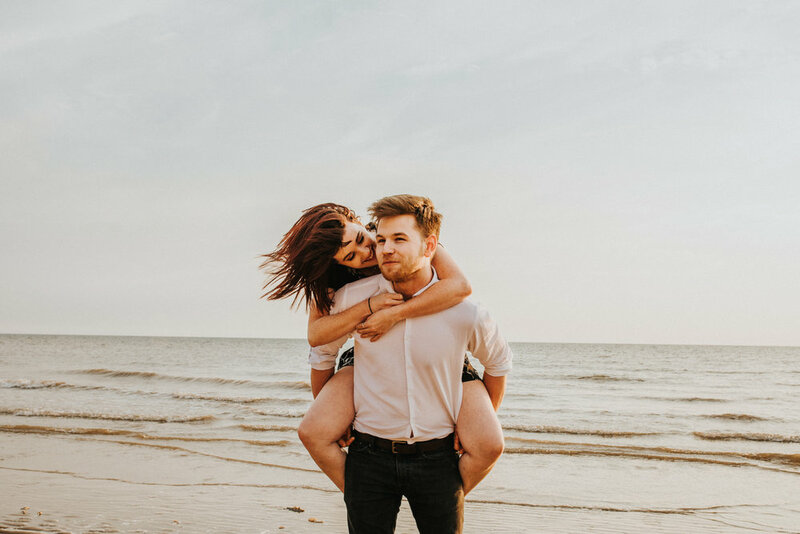 Often couples book their pre wedding shoot up to 10 months in advance so they are able to use images from the shoot for save the dates and invitations. Other couples like to keep their pre wedding shoot to a few weeks before the wedding to use it as an opportunity to chat over final details and plans for the day and have what they have done fresh in their mind on the wedding. Timings for pre wedding shoot are very location dependant, if you don't want loads of people looking at you or possibly being in the background of your images its probably best to not have your pre wedding shoot at 1pm in a city centre on the weekend. I usually suggest Sunday mornings/ afternoons or a weekday as they're often a little less crowded. Ultimately the best advice I can give is don't panic! Pre wedding shoots aren't a test and do not need to be formal or stuffy. Use it as an opportunity to get totally lost with one another away from technology, work and the stress of wedding planning. Its a time to laugh and smile and capture exactly why you are getting married. Let your personality shine- if you're goofy and silly with one another, let that show! If you make one another belly laugh everyday, use that in your photos, nothing beats natural smiles! And above all have fun- having your photo taken doesn't need to be scary!